← Wedding Talk: What’s in a name? Apparently, I talk more about the wedding now than I do about running. Uh, ooops! I did take a bunch of pictures on my run home on Tuesday, but of course, my computer at home is on the fritz, and I have no way to upload them at work. But for now, back to wedding talk. I’m telling you, I’m obsessed! You’ve seen the dress, but I’m also excited about the shoes! At first, I thought I was going to wear some old red sandals I had, then I saw these babies online, and couldn’t help myself: they were perfect! 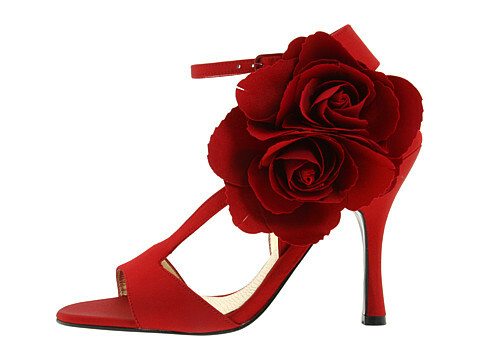 The lace dress, a mantilla veil, red roses bouquet, and these shoes. Granted, no one really will see the shoes, but I might give them a peek here and there. I know red shoes are far from traditional, but I never wear white shoes (unless they have zebra stripes, of course), so couldn’t imagine myself wearing them on my wedding day. And yes, the 4″ heels are far from comfortable, but I don’t plan on wearing them all night — thankfully, tradition in Brazil is to give all the girls flipflops during the reception so they can dance the night away. So I’ll be ditching these in favor of some comfy havaianas when it’s time to dance. I’d rather hear about shoes than running any day! LOVE the red roses. Stunning. You go, girl. At least someone else shares my love for these shoes. I thought they were awesome! where did you find these amazing shoes ??? I am getting married in 7 months , and I absolutely want them , it fits my theme perfectly!!! MERCI! THANK YOU! xxxx I will look now! I think the brand name was Nina, but I don’t remember the model name! Did some digging, brand name Nina, model name Critia. Good luck! I did not found them , but at least you gave me a GREAT site to shop for my bridal shoes ! merci so much…. thanx a million times . ever since forever ive planned on wearing red shoes on my wedding day. im not even engaged and im thinking of the shoes. i love the before pic! I’m the same way! It’s the new “in” thing now to wear colored shoes, but I could never see myself with white shoes… Plus, I’m known to throw on red shoes with a black dress or jeans, so why wouldn’t I do that when I’m wearing a white dress? I totally ditched my shoes too… and went barefoot! Muah ha ha 🙂 In this pic you can see how dirty my feet were (I am on the ground pretending to play the guitar). Ha, thanks for the compliment on the legs — they’re much more attractive from the side than from the front, when the thunder thighs are in full effect! That picture is hilarious! And yep, I’m known for prancing around with dirty feet too… Amazing how much dirt gathers under your feet when you’re wearing flipflops! Thanks for the link to the pictures — I love you cake! Isn’t it? Everytime I look at the picture it makes me smile! i just drooled ALL over my computer when i saw your shoes. OMG beautiful! Thanks! I still love my shoes!